I was excited to try this new event. With 4 transitions, it would be good practice for quickly changing shoes. But the best part, for me, would be not having to swim and be cold. Sounds wimpy, but I hate being cold. In this case, I'll get to start with a run, insuring I'll be warm. Then, I'll hit the road bike when it starts raining and start getting cold in time to run again and warm up. Then the mountain bike through the water crossings and finally onto the run again to fight the chill. This will be great! Robin & I practiced the mountain bike course. It's a great course with lots of turns, but the rocky descents are my only concern. I'll want to take them fast, but without loosing control and crashing. I rode my tri-bike for the first time yesterday. And rode it to the start this morning. I feel prepared. But the legs are feeling sluggish during my warm-up run. The sky is in the process of going from clear to ominous black. The wind is gusting and threatening to blow over the registration tents. The lake is all churned up like an angry sea. 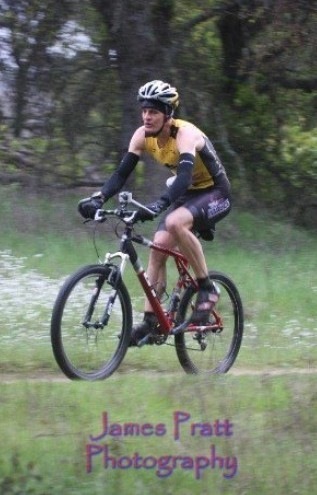 I didn't realize there was a sprint mtn-bike triathlon going on. They're actually swimming amidst those white-caps! I watch as the swimmers run up the beach, white-faced from the cold, and start the bike. Ken Hale, a 500+ tri finisher, says it was the 3rd hardest swim, just behind the Utah disaster, that he's ever done. Robin & the girls arrive and drop off my mtn bike. We gather and pray. Now it's time to start. Only 20 of us line up. Small group. Makes for no pressure - another nice thing about my race. 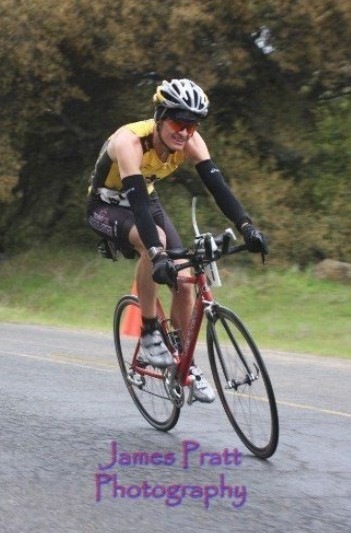 Robin, on the other hand, will be swimming in 48 degrees water tomorrow, competing against XTerra athletes from all over No. Cal. Too intense for me right now, but she's been training for it and feeling ready. Run #1: Go! I want to negative split the run legs so trying to run within my ability. 9 guys go ahead. But I catch 1. The trail is perfect condition. Then pavement. Then trail. We all dodge the puddles and arrive, feet dry, back at transition. 2 guys finish fast in 12:11. Then Bobby Carpenter at 13:12. Then 2 (a guy and a relay girl with dreadlocks) at 13:50. And then a guy at 14:11 with me, 3 secs behind him (6:55 pace) in 7th place. Road bike: It's starting to rain hard. It's a technical course so this increases risk of slipping. I'm good at the corners but will try to be careful. Fortunately the many little climbs help slow the speed before some of the corners. I'm not losing any time to the rain. I pass a few riders. But then a descending wet corner requires me to slow way down. Then another corner I take too fast and have to almost come to a stop in the other lane. Finally, the 180 turn also takes away a lot of speed. But I manage to pass a guy right after it. Other than that, sill a fast time.. except for the last .5mi straight section right into the wind… pushing as hard as I could, it still kept me to 16mph. I finish in 19:04 (21mph) and 3rd place. Run #2: Anna yells that a Hammer Gel is waiting for me at my transition. Ariel says, "You're stepping on it". I start the run and miss the high-5 from Anna so she tries to catch up to me running across the park to cut me off.. but I'm still just out of reach. She sure can run fast now. I feel good and want to run just a little faster than the first leg. I'm by myself. I make the turn, eat my gel, and notice that the puddles have doubled their size since the first lap? It's harder to avoid them. .5mi to go and the last guy I passed on the bike passes me back. He's fast. I can't re-pass him. I finish in 14:21 (6:42 pace) in 4th place. 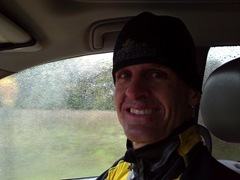 Mountain Bike: It's still raining hard as I hit the trails. I passed the fast runner in transition. Robin & the girls are positioned by the first stream crossing. "Whoa!" I hear as I splash through it. I've got the GoPro camera on the handlebars which adds some pressure.. I want to make a good video. I'm really focused, trying to calculate each hidden hole beneath puddles or the right lines through rock-gardens. One wrong move and I will fall off my bike and waste time. I'm not wearing glasses because they'll get covered in mud and rain drops. So far it's going good. I grunt and try to pull a wheelie into each unknown puddle or mud bog. Maybe it's wasted energy but I don't want the front wheel to sink. Crossing the paved road, volunteers cheer and I thank them. Up the long climb. The gradual descents are fun. This course really is cool. Over the bridge and up the first rocky section.. I make it, barely. 1/2 way through, my brakes are starting to weaken which makes my lines a little more erratic. 3/4 through and I'm getting cold and my eyes are stinging from the mud flying in them. Can't let it slow me down. I'm happy that I've cleaned all the sections, which I didn't do in practice with Robin. Now I'm almost to the finish and thinking, "Man, I'm glad I don't have to do 2 laps like Robin will do tomorrow!" All the obstacle dodging and steep climbs are exhausting and stressful.. and fun. The final mud puddles and Robin,Anna, and Ariel are positioned right above it. "Whoosh!" and they all scream with excitement. Wow, what a boost. I finish in 32:02 (12.3mph) in 3rd place. Run #3: The final run. We get the high-fives perfect this time. I notice my feet are feeling numb and my legs are weaker. I push through. This time the puddles are impossible to avoid. But I'm covered with mud anyway so I run through them all. I'm running hard also because that fast runner is behind me somewhere. Heading back, though, I don't see him anywhere. In the final 1/4 miles I see Anna positioning herself before the finish line. She starts early and I sprint to catch up and make the connection… we both cruise across the finish. My final run was 14:39, 6:50 pace. Close to negative splits (6:55, 6:42, 6:50). Total was 1:37:20 and 2nd place individual (1 relay was ahead). It was a blast, great course! But soon after finishing I started getting super cold. Fortunately, Robin swooped in, got my stuff into the car and cranked up the heater. Thanks, God, for a great first multisport race for the season. Anna is closer to the front. I’m farther back with mommy and daddy. But I tell mommy not to run with me, but to take pictures. I hear, “Go!” and the kids are running. I was running. Mommy was running with me. I stopped. My leg was hurting. And I kept running towards the finish. Then I had to go potty, but mommy said, “Keep running”. Kids go past me. The boys catch me but the girls didn’t. I’m almost done. I see Anna. I’m running fast but Anna caught me. She ran with me. I finished and got a medal. My leg was hurting a little, but when I got home, it stopped hurting. 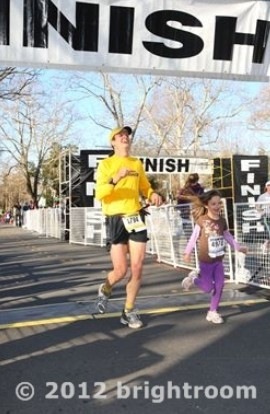 Daddy said I did the race in 12-1/2 minutes. It was a good day. It was a happy day. When you’re happy you smile like this. When it’s a bad day, you’re crying. It’s great to be on the starting line with Troy. We look around for Steve and Carrie Chavez. There’s Steve but he’s on the other side of the starting area. “Well, Troy you’ll just have to catch up to him”. We both laugh because we know he’s going to be way out there. At least we’ll look for them at the end. To run under 1:30 today, I’ll have to run 6:52 per mile. It’s a lofty goal but I'm going to try. Ready, set, go! 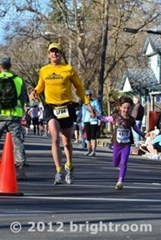 Troy takes off and I decide to hold back and run just ahead of the two 1:30 pacers. There are so many people around me that’s it’s hard not to go out too fast. The first few miles are pretty much just a straight shot…down 2nd St. make a right and go down 3rd St.
Mile 1 is 6:49. Okay, right on pace! I look back and can see the pacers so I know I’m good. All the runners are on the right side of the road and it’s crowded. Once there are no longer any cones, I scoot over to the left and enjoy some space. I can see Troy’s yellow FCA shirt and I’m hoping his toe is feeling okay. He dropped some furniture on it yesterday and we were concerned. Last year he had to pull out of this race because of a broken toe from a similar incident. Mile 2 is 6:49. Alright! Pacers, check. Troy ahead, check. Soon we are going to turn off this road and head out on narrow green belt paths. The 10Kers will turn off around there but I know it will still be crowded because the 1:30 pacers will have lots of fans for sure. I decide to try to stay just slightly ahead of the pacers as long as I can. A Forward Motion guys goes by and I tell him good job. “Is Carrie Chavez racing today?” He says she is…yeah!! I hope to see her! Mile 3 is 6:48. So far so good but I have 10 more miles! The pacers are right on me and I keep trying to stay ahead because I hear a lot of feet! This course is different. It makes me realize that I need to be more prepared in races and make it a point to check out the courses I’m doing. Not knowing where I’m going does make it more interesting and mysterious. The pacers slide ahead of me and I’m now surrounded by others with the same goal. As we meander through the various paths we pass through points where there are poles in the middle marking the center and sides. Like a pack of cyclists, we call out the poles to one another…”pole center”, “pole right”, etc. Even though we are competing, we are still looking out for each other…cool! Mile 4 is 6:44. One of the pacers has fallen back and the other is pushing the pace. So far I’m holding on well but it is getting harder. We cross over Covell Blvd. Mile 5 is 6:49. We turn onto another path. Wow, where is this going? Soon we are running on dirt along Pole Line Road. Oh yeah, I remember this…I used to drive to the airport on this road to fly home when I was in college. The 2nd pacer is long gone. Mile 6 is 6:52. I’m happy with that but I am a little concerned about my hamstrings which seem to be getting more sore. We turn right onto a gravel path that runs behind a golf course. Wow, I didn’t even know that this existed! The gravel is a bit too loose for my taste but my hamstrings like it. Mile 7 is 6:47. The pacer continues to run ahead of pace but I stick around anyway. If I loose contact, I’ll be running on my own…no thanks! I ask the Lord to help keep me focused. With you Jesus, I know anything is possible! Soon we are off the gravel and back on pavement. It’s nice to be back on solid ground! We cross Covell again and jump on yet another path. Mile 8 is 6:54. Just a little off but we’ve put in some good splits behind us. We are heading towards the “big” hill on the course, the freeway overpass. It will connect us to the 10K course and then we’ll be home free, right?! Mile 9 is 6:46. As we approach the overpass the pacer says “run it like a roller coaster, slower going up and fast going down”. As I follow his advice, I notice he’s actually charging up the hill…okay, well once I go down the other side I’ll catch him, right? Once on the other side, I cannot catch them going down. Okay, don’t worry…there is time. Mile 10 is 6:58. Oops! That was much slower! My hamstrings are sore and my legs feel like they’ve hit their limit. Don’t give up! I think back to a misunderstanding that Troy and I had recently and how I just gave up on trying to communicate. I felt so bad about that! I cannot quit now…I need to practice pressing on so I can do it in my marriage. Wow, I’m using my marriage to help my race…usually it’s the other way around! Mile 11 is 6:56. The pacer is not getting any closer! A few guys go by me and I cannot react. I soon notice 3 girls near the pacer. Wow, if I can catch up then I can move up in placing and get my time goal. 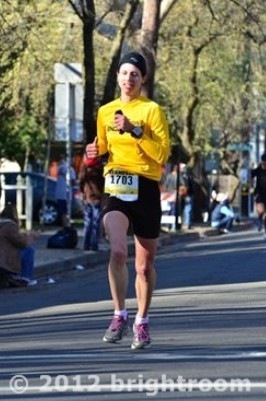 A local runner that I’ve raced against in the past is cheering on folks on the course. She looks at me and says “good job number 6”. Number 6? I look at my race number and it dawns on me that she was telling me I’m in 6th place. Oh, cool! Man, I guess I’m using all my brain power just to keep moving forward. Mile 12 is 7:02. Ugh! My goal is slipping away but I cannot quit! Just keep pushing!! The last mile always seems the longest! I’m getting closer to one of the girls and I try to pick up the pace. I make the final turn and mile 13 is 7:01. I am going as fast as I can so I’m happy with the effort. I see Anna ahead ready to run in with me. I grab her hand and we go. I look at the clock and I see 1:31. Well, thanks so much Lord for helping me persevere! I didn’t quit! We cross the line and I give Anna a hug. Thanks again Jesus! I find out later that I was closer than I thought! I was actually 1:30:44 and not over 1:31! Yeah! Awesome! Praise God! It’s been a long time since I’ve done an all-out 1/2 marathon. Robin & I scheduled this race as prep for our Boston Marathon trip in April. Robin has a big goal to break 1:30. I was planning around 1:28, but it’s a little up in the air since dropping something on my foot yesterday. It was difficult to run yesterday but feels good today. Rich Alesci is watching the girls for us while Leonie and us run. It’s great to be able to start a race together with Robin. The weather is perfect for running. The only thing I’d change is being able to use the porta-potty one last time. Should be ok.
Go! The first mile is going good. It’s long straight road.. good for this large pack. Robin is not far behind me. I saw Steve Chavez at the start and hoped to catch up to say hi before he left me in the dust, but too late, he’s far ahead now. We continue on the straight road towards the pedestrian overpass. There are a few women near me. 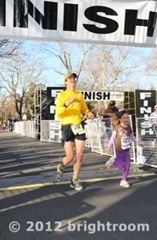 One is the same one I ran next to at the CIM relay leg #2. My Garmin says 5:20 pace so I know it’s off. Up above I can see the 10k leader running over the pedestrian crossing. 10ker’s go right onto the bridge while we continue onto a bike path around some neighborhoods. I feel like I’m keeping the same pace. But I don’t know because my Garmin is all out of sync. We zig-zag through neighborhoods and parks. It’s a good course. It keeps you on your toes. I try to take every tangent and run the corners smart. Doing this, I gain on and pass another guy who isn’t running the tangents. We’re running a walking path down a long street. I’m drinking water at the 2mi aid stations and planning my 1st gel at 6 or 7 miles. A lot of ROTC recruits in fatigues are volunteering to direct the race. I try to thank each one. On a gravel trail now. I love dirt trails.. makes me feel at home (in Auburn).. and I actually pick up the pace initially. But the gravel is loose and I know it’s actually taking a toll on everyone’s efficiency. We’re running along a golf course, through a Wild Horse Preserve or something. My toe hasn’t hurt at all. I hear footsteps overtaking me. 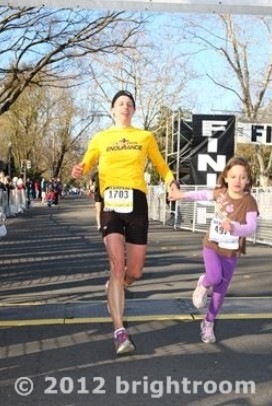 I get passed by the girl in yellow and an FMC guy. Still on the gravel trail. I make a quick bathroom break. Now I’m determined to catch them. I start picking it up. Using every descent through a tunnel to make up ground. Slowly I’m getting closer to the FMC guy. The girl in yellow is pulling farther ahead. It’s a big effort but I’m feeling good. Closer and closer, winding through the many paths and green belts in Davis. Finally I make the pass and feel like I’ve redeemed my nature-break stop.. as long as I don’t blow up after this. I start climbing up over the pedestrian bridge. Quite a hill. I take my 2nd Hammer gel and try to maximize the downhill as much as possible. I tell myself these last 3 miles are like Wildflower: a big climb, following by Mile 12 across the top, and then the freebie Mile 13 down to the finish. My knees are getting sore and I’m not feeling comfortable anymore. This is it. I’m telling myself this is the last mile. I pass a woman. I also pass a kid that has been up ahead for a long time. He asks, “Are you on 1:30 pace”. I tell him we’re a couple minutes under and that he’s definitely going to make it. Mile 12: 6:51. Don’t know why that mile was so slow. I guess I’m slowing down. But this is it. the final mile. 3 FMC teammates pass me. A guy, a girl, and the same guy I passed earlier who nicely encourages me to “Come on!”. He’s right. It’s the last mile, I gotta go, even though I’m hurting and uncomfortable. I can’t catch them. I’m impressed with their surge in these last 2 miles. There’s Leonie, Rich, Reed, and Ariel. Anna is standing in the middle ready to run with me. She’s runs so fast now that I don’t even have to slow my pace. I finish in 1:27 for 6th place. My fastest straight 1/2 marathon in years. Thanks, God, for a great day. Yesterday it was possible that I broke my toe..again, just like last year at the same time. But today was evidence that it’s fine. Whew! Thanks again, God.